Five years since its last update, can this venerable software studio make up for lost time? 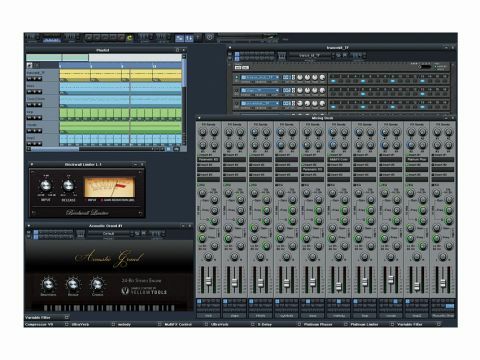 Orion is one of the most comprehensive software studios around, and it's especially strong on instruments and effects. More mixer groups and inserts. Pro-9 is a brilliant take on the TR-909. Song Merge is a great idea. New sample content is quite usable. Brickwall Limiter is right on the money. Still dead easy to use. No longer a ReWire client. No internal bouncing or freezing. Version 8 now gives you an increased number of mixer groups and inserts. Orion 8 includes Pro-9, an excellent emulation of Roland's legendary TR-909 drum machine. An old dog gets a new look - the sampler is one of many instruments that benefit from Orion's new skin. Orion is what Hollywood would call a "sleeper". While other DAWs and software studios have achieved blockbuster status, this one-stop virtual studio for Windows has quietly grown and evolved, picking up a number of fiercely dedicated users along the way. It's easy to see why. The last time we had Orion on the test bench, it was at v7 and the year was 2006. We liked it at the time, awarding it four stars. Much of what we liked is still there, and pleasingly, much of what we didn't has been attended to in the intervening time. "It baffles us that Orion is not a household name among computer musicians - it's a killer package." Orion began life as a software studio, as opposed to a DAW. It was intended as a means by which pattern-based music could be composed using software instruments. Over the years, it's been filled out with audio recording, studio-style effects, VST support and other niceties suited to full studio productions. Is it a fully fleshed out DAW? That depends upon your needs. Audio editing is kept to a bare minimum, though you do get basic functions such as normalise and reverse audio. It's nothing like what we've come to expect from, say, Cubase, or even FL Studio, though. Nevertheless, some pro audio features are now in place, most significantly plug-in delay compensation. If, on the other hand, you prefer working with patterns and cobbling them together into songs, perhaps tossing in a little audio along the way, then Orion will be perfectly suited to your needs - and especially so if electronic music is your bag. We raved about the quality of Orion's included instruments and effects in our review of v7, and we like them just as much now. Synapse has been focused on smoothing workflow of late, and it shows. There's a new navigation bar in the Arrangement window, and mouse wheel support in all views. Zooming has been improved and patterns can be resized with the mouse in the Playlist. All these seemingly minor tweaks go a long way towards making an already intuitive GUI even easier to use. It's also prettier - in places, anyway. Some bits get a makeover, while others don't. If you don't like the look, you can choose a variation on the Azure skin from version 7, or roll your own using the new skinning system. One of Orion's long-standing key features is a mixer inspired by hardware desks, enabling old-school producers to work with familiar tools and techniques. That mixer has now been given a little more firepower, with eight sub groups (twice the number of the previous version) and an extra insert on each channel (now totalling three). New pan law options are also in place, as is the aforementioned PDC. More interestingly, you now have the ability to automate the mixer using patterns in exactly the same way as you can the instruments. New effects are on hand, too. We've got an improved compressor with sidechaining, but the brand new Brickwall Limiter really made us sit up and take note. It's as simple as can be, with Input (gain) and Release knobs, but the sound is certainly quite serious. The new Vintage Chorus looks very like those included on classic Roland synths of the '80s, and it lives up to the look sonically, sounding a little dirty and a lot lush. Synapse has dished up some keen new ideas with version 8. There's a new Song Merge function that enables you to combine multiple existing projects into a new song. You can bring in individual tracks or the whole shebang. Orion now has Templates, too. Not to be confused with song templates, these are more for plug-ins, and they allow you to save combinations of instruments, routing, effects and keyboard splits, even including MIDI maps and automation. We expect that these will prove particularly useful for setting up audio tracks. We expect upgrades to come loaded with new features, but it's unusual when existing features are jettisoned without some sort of replacement in place. However, Synapse have taken the bold step of shearing Orion's ReWire functionality. Sure, ReWire is still there, but Orion now only acts as a ReWire master and not a slave, as it could previously. This is the norm for most DAWs, but Orion's long legacy as a software studio means that there are existing users for whom this may be a sticking point. There are also some things missing that we've come to expect from modern music software. For instance, freezing and internal track bouncing are absent, so if you want to render a track to audio, you'll have to render it as a file then import it back in. It's not that big a deal, though, especially considering that freeze functions are arguably less necessary with powerful modern systems. We've always been impressed by the usability and fidelity of Orion's sampled and synthesised sound sources. This time, Synapse has called upon Yellow Tools to provide multisampled instruments, including acoustic drums, superb acoustic guitars and electric bass. These are rolled into presets for Orion's Sampler and can be tweaked to meet your needs. Another new addition is the Acoustic Grand instrument. While this isn't as comprehensive as a full-blown, multi-gigabyte effort, we were still surprised at how good it sounds, particularly in the mix. Again this is the work of Yellow Tools. The stunning Pro-9 drum machine gives a tip of the hat to Roland and is one of the best TR-909 emulations we've heard. It has all the oomph and snap of the legendary beatbox, with a sequencer section that looks like it's straight out of the '80s. Orion's DrumRack has been beefed up with drag-and-drop MIDI grooves and a gritty 12-bit option. And now, any sound can be mapped to any MIDI note. On a related note, there are now GM-mapped kits in the kitty, too. A side note on instruments: unusually, the wicked Toxic 3 FM synth is only available in the 32-bit version, while the 64-bit install includes Toxic 2.5. It baffles us that Orion is not a household name among computer musicians. It's a killer package and the total cost is less than you might expect to pay for even a couple of its included instruments. The interface is clear and it's a snap to make quality tracks with it. The developers seem to care about what users want, and updates are frequent (even if major point releases are not). Our quibbles are few and do nothing to hinder the power on hand. While we'd love to see the return of ReWire slave status, we can live without it - ReWire itself seems to be used less and less these days anyway. The improvements present in Orion 8 seem intended to move it out of the strictly electronic scene, providing quality samples and a better mixing experience. It's still a winner and still easily worth the price of admission.